Tired Of Investing Countless Hours And Thousands Of Dollars Only To Watch Your Best Clients Slip Through Your Fingers? A client (we’ll call him Carl) shared me with me how frustrated he was that two more clients had dropped his service that month. I could literally hear the pain in his voice. Carl was more than bummed - he was starting to question whether or not what he offers is still valuable enough to keep his clients spending the $200+ a month for his program. 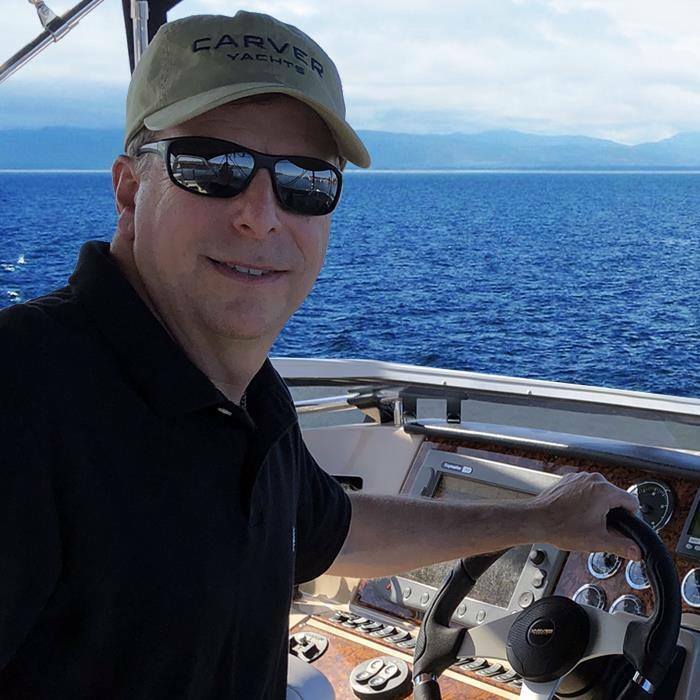 I hated hearing Carl question his worth and value to his community because has truly has a great ‘done-for-you’ program that is not just invaluable; it actually makes his clients’ a ton of money! The problem Carl faced is that unfortunately, his customers were doing what most of us do. Carl was missing a key client retention strategy in his delivery system that could used properly could easily transform these “client drops” into raving loyal fans who eagerly spend that $200, month in and month out - without blinking an eye. Then there is Susan (again not her real name). Susan was so overwhelmed one day she asked for an emergency 911 coaching session. You see, Susan has tons of sales flying in the door each day - but about ten times a week a customer will ask for a refund. Each time her supposed expert customer service team just grants the refund without trying to save the sale - not to mention the occasional outrageous request that completely baffles everyone to the point that they just ignore it and give the customer their money back. So I suggested that Susan immediately implement a new customer retention strategy and mindset in her company’s culture. This customer retention strategy is designed to not just keep the customer and the sale but is guaranteed to increase repeat business by at least 30% – not to mention all the referral business that is sure to follow. Can you relate to the challenges that Carl and Susan are experiencing? Maybe you’ve been confronted by one of the many sales saboteurs that cause well-meaning business owners to unwittingly lose a ton of profit — and often their best clients – resulting in stress and sleepless nights? Are You Losing Sleep Over One of These Retention Challenges? Your business requires a constant flow of new leads to generate consistent income, but those lead sources have slowed to a trickle or become exorbitantly expensive. Worried your programs and products are somehow failing client expectations and too often you feel sick to your stomach when you lose another client. You are perplexed when customers leave your programs or don’t buy again because you know beyond a shadow of doubt that your stuff is WAY better than the competition. You regularly wish, hope, and pray that your customers would refer you to their friends and colleagues but it never happens. You try technique after technique and just end up wasting lots of hours and dollars with minimal referrals. You are concerned that your customer service is falling short. You struggle trying to determine how to provide a unique ‘over-the-top’ world class service experience for your customers, clients, and patients without breaking the bank. Or worse yet…is there a general ‘negative buzz’ about the quality of your programs or business practices, or those of others in your industry, which may be unfairly repelling your ideal clients away for you? If you answered yes to any of the questions above, you’re not alone. This revelation may not bring you a great deal of comfort, but rest assured we do have some good news. Given how many entrepreneurs, and service-based business owners are struggling right now, we’ve decided that the timing is perfect for us to come together to deliver a very powerful ‘profit-transforming’ program, that is guaranteed to significantly boost your bottom line and create raving loyal fans – in any economy. This Extraordinary Program Will Show You, Step-by-Step, How to Implement Easy, Inexpensive and Exciting Strategies That Will Absolutely Deliver More Money Into Your Bank Account! Nine Stealth Strategies Guaranteed to Rapidly Increase Your Repeat and Referral Business – Even in a Recession! Meet Melanie Benson. She's known as The Million Dollar Lifestyle Business Coach because she knows first-hand how to build a successful, thriving, freedom-based company. 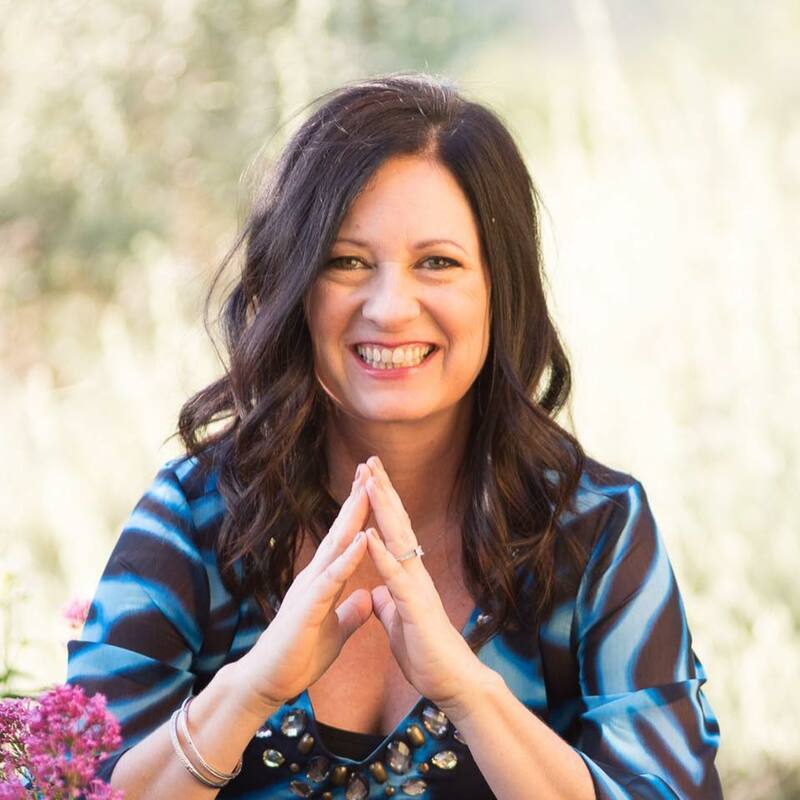 With over 12 years in corporate America and 18+ years as a business owner, she works exclusively with entrepreneurs who are ready for a “sustainable” six to seven figure lifestyle business. She is the co-author of Entrepreneur.com’s Start Up Guide to an Information Marketing Business and Visionary Women Inspiring the World, and has served as a faculty member with various global e-commerce training centers - in addition to being featured in my sixth book, Decide - The Ultimate Success Trigger, and presenting at my Dream Business Academy. I’m Jim Palmer. While I’m best known internationally as The Dream Business Coach, I’m also referred to as the go-to resource for smart, effective strategies for maximizing the profitability of customer relationships. I’m the founder and dean of the Dream Business Academy, creator of the world-famous No Hassle Newsletters, and the author of numerous wildly popular books. My book on customer retention strategies, Stick Like Glue, received rave reviews by some heavy hitters in business and marketing. I am all about equity, not just income — and the only real equity in most businesses and the best equity to be had in any and every business is a very, very, very "sticky" bond by relationship with customers. Sadly, most businesspeople invest far more in pursuit of the next new buyer than in, as Jim puts it, strengthening an everlasting bond with already acquired customers. His book sets everybody straight on this and lays out a sensible plan for getting it right, incorporating the very best glue I know of and have used personally to make and sustain multiple businesses and a fortune: the customer news4etter. Read this book. Build equity. The difficult truth is that the business environment we business owners find ourselves in today is tough, whether in a recession or when things are going well. Sorry if that sounds like ‘glass half empty’ thinking, but it’s the reality we are currently facing. However, the good news is that despite how tough it is, not every business is suffering. In fact, many businesses are doing extremely well. Before we answer that, for now, we’d like you to relax, push back in your chair, close your eyes and imagine what it would feel like deep in your heart to be able to celebrate on a very regular basis your business getting more profitable repeat business from your current customers! Almost like your celebrating your birthday or Christmas year round! And while your eyes are still closed, now try to imagine how great it would feel to have your accountant tell you that your profits are zooming! And you smile big because you know that this sudden shift is due in large part to your current customers regularly sending you more referrals – and referrals rock!! Take it from both of us; it is indeed a great feeling! You’d Be Wrong To Shrug This Off As Some "Pie-In-The-Sky" Celebration Fantasy – It’s Not! This not only happens in both of our businesses. ...a direction based on the mind-blowing powerful business and life-altering strategy known as customer retention. Look, most business owners know that they need a constant stream of new clients to get ahead, or in some cases, not go backwards. But new customer acquisition is only half of the story. However, relying exclusively on this strategy is critical mistake, and one that 95% of business owners make – spending the vast majority of their time and resources on attracting new clients. But there is a better way, a smarter way, a more profitable way to grow a business and we’re going to reveal these powerful strategies. 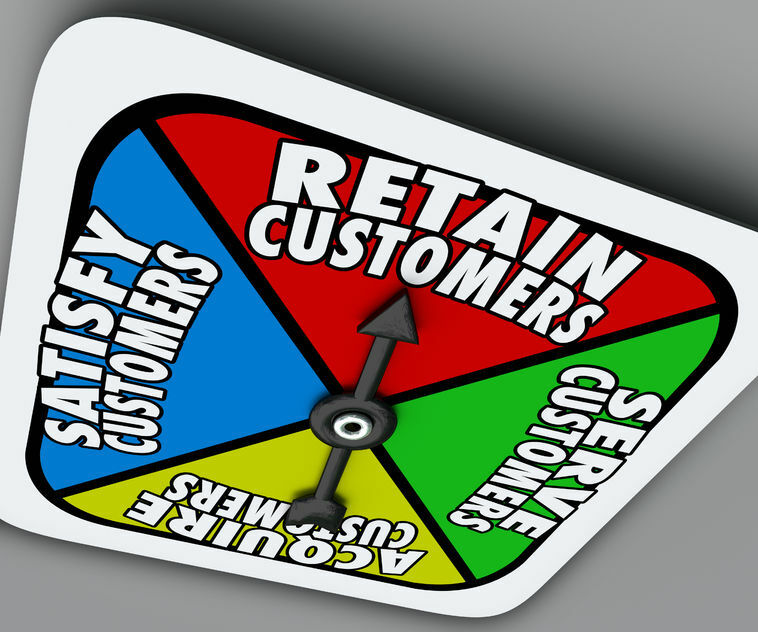 Did you know that each 1% increase in customer retention equals a 7% increase in profits? That’s HUGE! And did you know that it costs at least five times more to obtain new customers than it does to retain (and sell more to) customers you already have? And did you also know that the businesses that are gaining market share fastest are doing so by plugging the holes in their system and retaining more customers? 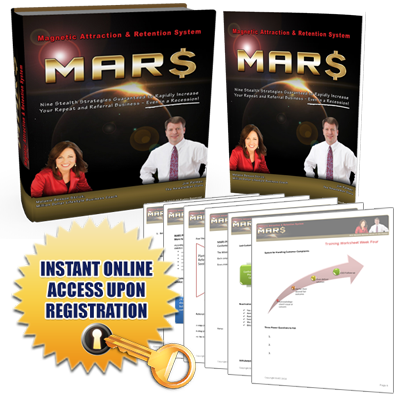 The dominant strategy at work here is called customer retention, and once you fully appreciate and implement the strategies we’ll teach you in the MARS Training Program, you’ll simply not believe the results you’ll experience in your own business. We’re guessing that while you may be familiar with customer retention, your greatest emphasis has always been on new customer acquisition, not customer retention. Well don’t beat yourself up. Most businesses use this approach but to be candid, it’s a mistake. And when times are good and money is flowing much more easily than it is now, it’s a strategy that produce some results and hides some of the pains you’re feeling right now. And at the very least, it hides the fact that you could be doing much better! Here’s an example. Imagine washing your car in your driveway. You’ve got your sponge, a bucket and a ton of soap. You head over to the water faucet to fill up your bucket but by the time you get back to your car the water is half gone. You begin to race back and forth over and over, expending a lot of energy and wasting tons of time, trying to get enough water in the bucket fast enough to counter-balance the leaks. 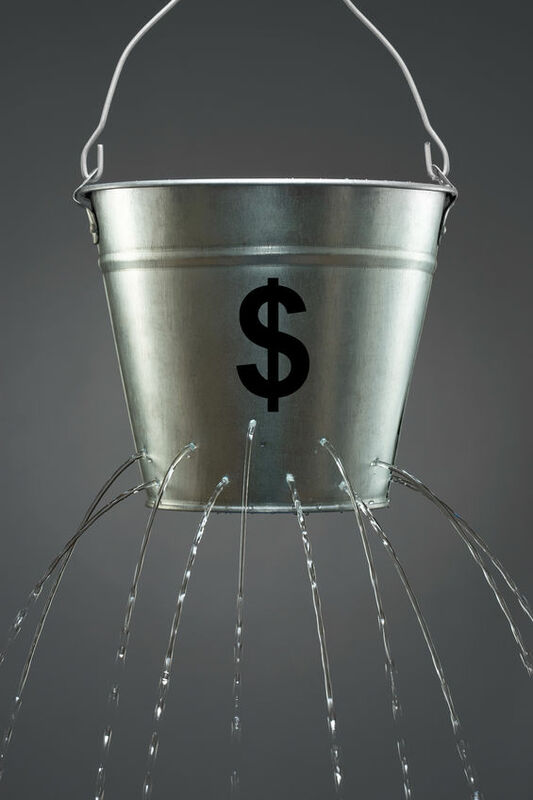 The leaky bucket is a problem many entrepreneurs face. Trained to focus mostly on generating new leads and sales, they work harder and harder on new business. Meanwhile, they neglect implementing the techniques necessary to take care of the business they worked so hard to attract. Not only is it exhausting. But, it is a sure-fire way to alienate the customers who once were excited to use your products! By simply plugging the holes in your leaky bucket your hard-earned sales turn into raving fans who eagerly buy more, stay longer and refer profitable new business to you in the process. To fully understand and implement this strategy it will require a mindset shift. A small one for some and a major overhaul for others! That is one of the big reasons that we have teamed up together. I bring a dynamic range of marketing, retention and business building experience to the team, in addition to Melanie’s own business building and marketing expertise. She is an expert at helping entrepreneurs understand the mindset shifts necessary to implement the MARS Training Program, both for the business owner and their staff. You’re Probably Curious About The Nine Stealth Strategies Guaranteed to Rapidly Increase Your Repeat and Referral Business – Even in a Recession! Right? We brainstormed for weeks and weeks on how we could transfer all the principles, techniques, ideas and case-studies we have accumulated over the years and came up with nine core strategies we felt would best cover everything we know. Stand out amongst their competitors as the best choice, even if they are price shopping! Generate additional sales from the clients who already love them without feeling pushy or appearing “salesy”! Offer stellar delivery and customer service when the bank account is tight, time is limited, and they already wear too many hats! When you finish the training you’ll have a profit blueprint unlike anything else out there – which makes you the thought leader of your industry! And trust us, if there has ever been a time to stand out from the crowd in a positive way, it’s now! 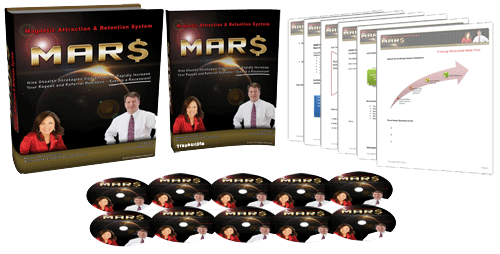 With every dollar counting, you want your customers to feel confident that they’ll be well taken care of - and the MARS Training Program is exactly what you need to fill up those holes in your current system! The bonus call alone was worth the investment! For the MARS Program to truly reach maximum effectiveness, you’ll need to get your team on board. Plus, I revealed the exact strategy I used to not only get employee compliance, but to get them to also police themselves! We’ve also each decided to share the most powerful business building lesson we’ve learned in each of our businesses with you. These are not industry specific and just these strategies alone have the potential to blow the doors off your business! Believe us when we tell you that these two bonus lessons will be more than worth the entire investment. Apply these two strategies in your business and you will consider the MARS program itself as "the bonus" – they’re that powerful! "Sounds Great! So How Can I Get My Hands On The MARS Training Program?" We’re glad you asked! But first, let us tell you about our crazy guarantee! We’re so confident that you’ll not just love the MARS Training Program; we’re guaranteeing that you will get amazing results in your business, if you simply apply what you learn. Our “6×4 or Else” Guarantee says that if after 6 months of applying what you’ve learned in your business, if you don’t get back AT LEAST 4 times the investment you paid to be in the program, we’ll refund your entire investment! We’re REMOVING ALL OF THE RISK and GUARANTEEING YOUR RESULTS! This is probably a good time to mention who this training program is for and who it is not for. Who Is the MARS Program Designed to Help the Most? You have a business that is generating sales but you don’t have all the systems in place to take good care of the clients you have. You know you could benefit from better retention techniques but don’t know how to automate or delegate them so you hold off. When you have had a request for a refund you get confused or uncomfortable with the “right way” to balance good customer service with staying profitable. You believe that excellent value is essential to keeping good clients but you don’t always know how to consistently deliver it. You have fear or concern about losing clients you worked hard to get. You know your current referral program (if you even have one) is not performing at its best. You like staying on the cutting edge of new ideas and sharpening your skill saw. You are willing to invest the time and energy to learn and implement important strategies to sustain higher levels of growth. Who Should NOT Invest in The MARS Training Program? It’s important to us that these strategies get into the hands (and minds) of business owner who will really do something with these proven techniques. With that in mind, if you aren’t a good fit for this work then we’d like to steer you away right now. If you are constantly seeking a silver bullet or magic pill and falsely believe by simply investing in this program (or any program) your business will be miraculously saved. If you’re closed-minded or feel that you cannot tell get your staff to try something new for fear of upsetting them. If you are a professional seminar goer and/or course-taker but not an implementer. If your business is teetering on the brink of collapse, you have our sincerest best wishes but this program should not be considered as a quick fix or life jacket. If you think a guru, expert ,or even the government should be responsible for turning your business around. If you consider yourself an expert in retention or referral business and are looking to swipe more content for your programs. If you closely resemble any of the above, please do not take this course. It will likely frustrate you. 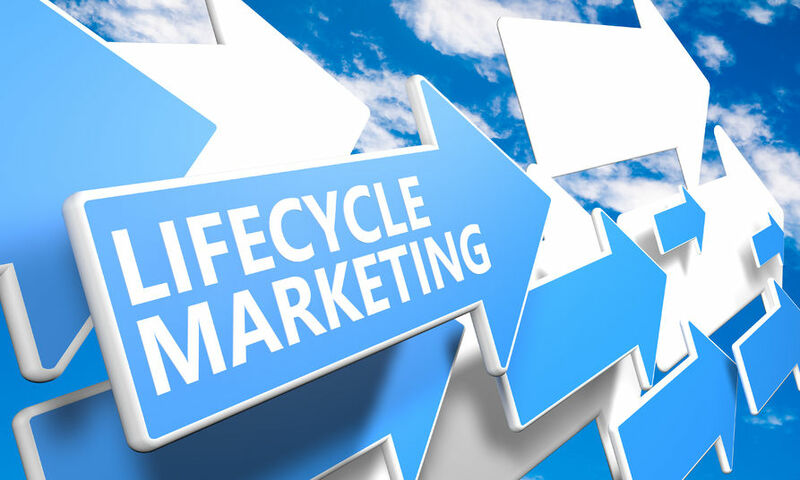 "Okay, I’m Ready To Transform My Leaky Bucket into a Solid Retention and Referral Magnet... So What’s My Investment?" We’re offering you two options to change your world with a trip to MARS! 1) Choose the digital download version for only $297! MP3 recording of the incredible bonus module #5! 2) Choose the hard copy version of only $397! PLUS, you’ll also receive a custom binder with printed transcripts, printed course outlines, and 10 CDs! 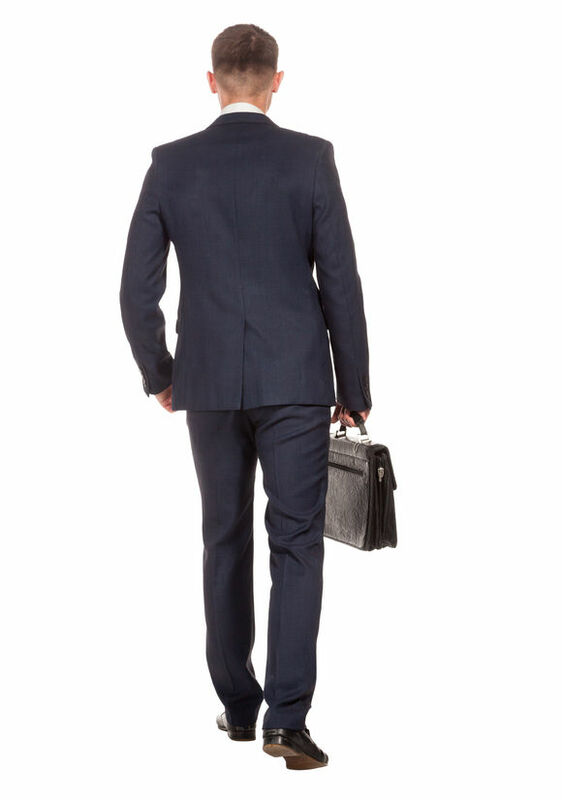 It’s Time To DECIDE: Either Your Business Is Growing Easily With Rising Profits, Or It’s Not! If you toss and turn every night wondering how to add more value to your offerings without losing profits – you need MARS. If you’re finding it difficult to stand out amongst your competitors – you need MARS. If you still haven’t mastered how to turn your customers into excited, loyal, raving fans who can’t wait to send you more business – you need MARS. If you have not mastered the art of generate more sales from the clients who already have without appearing salesy – you need MARS. If you think offering stellar delivery and customer service is not possible without busting your bank account – you need MARS. 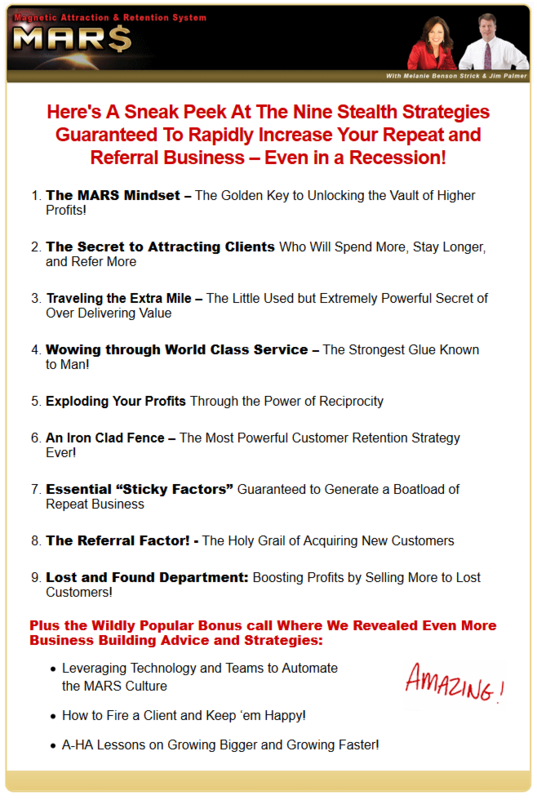 If you don’t know the secret formula for transforming an unhappy client into a raving referring client – you need MARS. If you’d like to learn the secret formula for getting problem customers to behave and ‘play nice’ (and keep paying you) – you need MARS. What is saving one lost customer worth to your business? What is saving four lost customers worth to your business? We would hope that whatever business you’re in, an average customer has a lifetime value of at least $397. If it does, then this is a no-brainer and you should proceed immediately to the no risk reservation form below. Look forward to seeing you on MARS! "Yes Jim, I'm tired of struggling and excited to get The MARS Training Program so I can significantly boost my profits with the customers I already have!" Please Choose Your Option Below! You’ll get immediate access to everything on our secure download page! You’ll get immediate access to everything on our secure download page PLUS you’ll also receive the custom MARS binder with printed transcripts, printed course outlines, and 10 CDs!